My blog posts from the journey can be found by clicking here! El Camino de Santiago del Norte or Ruta de la Costa is a less travelled route to Santiago de Compostela. El Camino del Norte -as it’s best known- follows the Spanish Northern coast from the border with France and it goes along the Basque Country, Cantabria and Asturias to finally enter Galicia and reach its destination Santiago de Compostela with its impressive cathedral where the tomb of apostle St. James is. El Camino del Norte was one of the first pilgrimage routes to Santiago de Compostela when most of the Iberian Peninsula was still under the dominance of the Muslim. El Camino del Norte was already travelled in the 9th century thanks to the protection that high mountain ranges (Cordillera Cantabrica and Picos de Europa) provided for the Christian pilgrims since the Muslims couldn’t dominate that part of the Iberian Peninsula between the mountains and the North coast. Therefore, the pilgrims walk between the snowed mountains and the beautiful coast, enjoying an impressive view of the mountains on one side and in touch with the sea on the other side which makes it very easy to find breathtaking cliffs or amazing solitary beaches. The landscape is very green, full of forests and prairies, and the way also goes through beautiful coastal villages with the best food and cider that you could imagine. The Northern Way flirts with beaches, cliffs and coastal towns for 80% of the route, until it reaches Ribadeo, in the province of Lugo. There is no end of charming ﬁshing villages, of capes that dive bravely into the sea, or the indiano houses and estates, almost always accompanied by a couple of palm trees brought from the other side of the Atlantic. I would love to receive your blog. I’m trying to decide on my sept/oct route 2014. Possibly branch off onto the Primitivo via Oviedo. I have just come back from seven days walking from the airport at Biarritz to Bilbao. I would really recommend doing the Sentier Littoral or coast route from Bidart to Hendaye and then taking the ferry across the Hendaye/Irun estuary and continuing the coast walk before joining the Camino del Norte before Pasaje de Juan. That first day was divine. Please note that it is currently very warm, sunny and humid. It is a much more demanding walk than I would have imagined. There are also about 60 plus pilgrims per day so accommodation was sometimes a problem…. 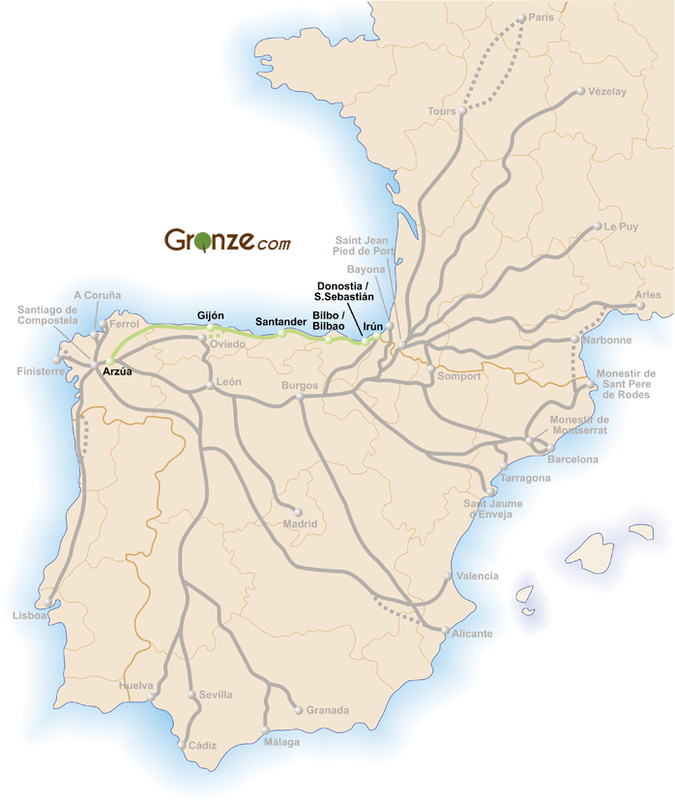 Headed to Biarritz in late April to walk the Camino del Norte. Please do you know of a good detailed trail map or book that breaks down the stages? Hi there! Other than what’s on my website I just picked up some materials along the way. I saw people with books detailing the albergues etc, but I didn’t feel the need for one, though I admit I did very little planning going into it. With the Camino there’s not always a right or a wrong way, but I’m sure there’s been many books published more recently with the kinds of details you’re after. Buen Camino to you! Thanks for writing such a great blog! I have been following your posts since your PCT thru. I’m thru hiking the PCT this year and thinking about the Camino in the spring of 2016. If you could do the Camino over again, would you choose the northern route again? Also, is starting in March better than April? The Camino will be my first long walk in Europe. Hope to read more about your adventures in the future!